The Apollos finally lost, but is that enough to move them down our power rankings? After watching the Orlando Apollos dominate for most of the first half of the season, the last thing anyone expected was for Arizona, on a three-game slide, to come in as a near double-digit road dog and pull off the upset. And, yet, here we are heading into Week 7 and there's less separation at the top of the power rankings than before. Yes, the Apollos had a bad game, but does that mean they're no longer the best team in the Alliance? 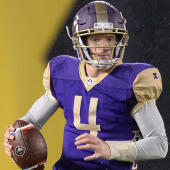 Moving past Orlando, the rest of the AAF remains largely a jumbled mess, too. Spots 3 through 6 in this week's power rankings are especially muddled. What that means is the playoff race, particularly in the West division, should be fascinating over the next four weeks. For now, here are the latest power rankings.